With a new project finance agreement having been signed off recently, the Ankara Bilkent Integrated Healthcare Campus is set to push forward. The deal was signed under the auspices of the Turkish Ministry of Health, which has been charged with overseeing the design, finance, construction, and operation phases through a Public Private Partnership (PPP) model. Signed on March 27 2015, the initial agreement qualifies as the largest project to be signed in Turkey’s healthcare field under a PPP model, and is to be implemented by DiA Holding. Upon completion, the project will hold the title of being the largest hospital in Europe, as well as the largest hospital constructed under a single contract in the world, with a total cost of €1.2bn. The credit extended for the project amounts to €890m over a 15 to 18 year term, and will be used to partially finance the project, provided by the companies listed in the project details. UniCredit Bank Austria will also act as the financial advisor for the project, among its other financing organisations. At the same time, Siemens Financial Services has provided the largest credit tranche to date in Turkey’s healthcare sector. The PPP model is a new investment and operation model in the healthcare industry in Turkey. Such models have already seen widespread application throughout the world, offering Turkey many examplars. The project is to be implemented in collaboration with the private sector, and is intended to offer services at contemporary standards to citizens by lifting a significant load from the public, in terms of investment, finance and the quality of services. In this model, it is intended that healthcare services will be completely provided by the public, as has been the case so far. At the same time, the finance, construction and operation of the hospital campus is undertaken by the private sector. Accordingly, it is planned for the public to make significant savings, accommodating the healthcare services to an increased population, and at the same time, see an increase in the quality and efficiency of services. 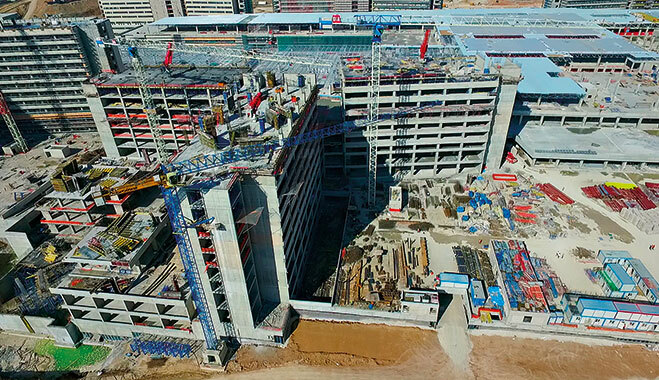 The Bilkent Integrated Healthcare Campus, with an indoor area of 1.3 million sq metres, will be the largest hospital complex in Europe, and also the largest built under a single contract in the world. At the campus there will be the capacity for a total of 50,000 patients, 5,000 of whom will be in the emergency department. It is foreseen that patients will be served on a daily basis, with the hospital having a capacity of 3,804 beds. Employment will be provided for more than 8,000 sanitary and non-sanitary personnel. It is estimated that up to 100,000 people will visit the Bilkent Healthcare Campus daily, including patients, visitors and personnel working in the hospital complex. It is expected the Bilkent Integrated Healthcare Campus will not only serve Ankara, the capital of Turkey and the surrounding provinces, but will also evolve into a regional medical centre; it is hoped the hospital will place Turkey at the forefront of international healthcare tourism, and offer services to the surrounding countries (Turkey is already a major destination for healthcare tourists from the Middle East). With the opening of the Bilkent Healthcare Campus, 14 hospitals within the border of Ankara will be closed. All personnel, including doctors, nurses and existing patients, will be transferred to Bilkent Healthcare Campus. The project will take place under the authority of DiA Holding. The firm was founded in 2007 and has focused beyond traditional contracting activities. The first works that introduced DiA Holding on a world-scale were prestigious projects realised in Baku, the capital of Azerbaijan. It has shown itself to be a leading investment and operation organisation. Within this scope, it operates in the Middle East region, primarily in Turkey and Azerbaijan. DiA has a proven track record, meaning the project is in safe hands. It has, in particular, experience in the area of healthcare. DiA Holding, in addition to the Bilkent Integrated Healthcare Campus Project, also signed the credit agreements for the Mersin Integrated Healthcare Campus Project, totalling €272m in November 2014. The 1,294-bed capacity hospital is also developing rapidly, at present. In the annually published list of ENR – one of the world’s most prominent engineering publications – it was included among the world’s top largest 200 contractors and international designers in 2012 to 2014, and has won numerous awards with the symbolic projects that have been undertaken so far, by publications such as Time, Wallpaper and the international real estate show MIPIM. Its previous Azerbaijani projects have been led by the Heydar Aliyev Center, while the world-renowned architect, the late Zaha Hadid, provided the architectural design. DiA has signed many other works in Azerbaijan, led by the Shahdag Summer-Winter Tourism Complex, which is the only ski centre in the country. DiA Holding, in line with its goal of becoming a new generation investment and operation company, has started to expand its fields of activity to include the healthcare sector. The push towards increased focus on healthcare costs is born of a belief that it will be one of the most important sectors in the 21st century. In addition to the Bilkent Integrated Healthcare Campus, the Mersin Integrated Healthcare Campus will also be one of the largest healthcare complexes in Turkey, with its indoor area of 355,000 sq metres. When the campus is taken into service, it will offer employment to 2,850 employees in total, 1,350 of which will be sanitary personnel and 1,500 non-sanitary personnel. It will have a capacity of 1,294 beds and will serve an average of 10,000 patients on a daily basis, 900 of whom are expected to be emergency patients.